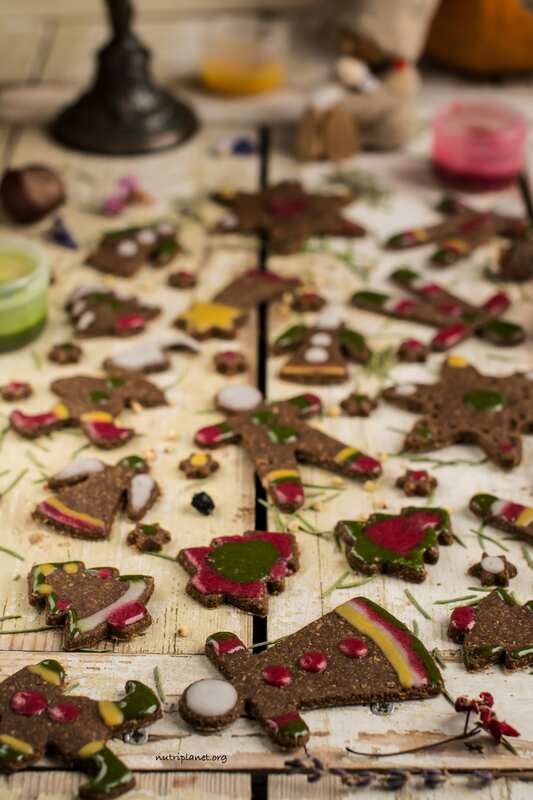 The Best Soft Gingerbread Cookies recipe is the newest on blog and I’m totally addicted! 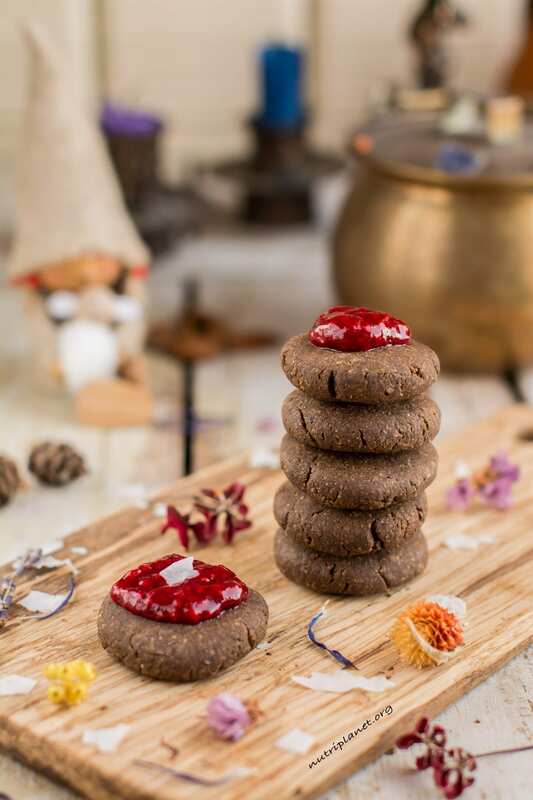 Vegan Gingerbread Cookies back from 2014 using coconut oil, dates, buckwheat and oats. NB! Don’t forget that there is tutorial video further down! My vegan gingerbread cookie dough rolls out super well! It would seem almost impossible to come up with something new, interesting and delicious once again? On the contrary, I managed to develop my last year’s recipe to the next level with this one single secret ingredient. Most noteworthy, it’s an item I only discovered and started to consume thanks to vegan Candida diet. Since coffee is not allowed on Candida cleanse diet and also later, I started to look for good substitutions. Now, I had heard of all the alternative coffee drinks such as grain coffee drinks made of barley, rye, chicory and spelt. However, I had never been curious to try them out and to be honest I was always a bit sceptical being a fan of specialty coffee. Then, one day when I was browsing the shelves in the supermarket, I discovered liquid paste-like chicory in a small jar and I decided to give it a go. To be honest, it was a taste that I needed to get used to, but starting with small quantities I finally grew on it. Furthermore, I made an observation that when diluted and sweetened, the paste gave a perfect caramel taste to any dish. Hence, it came to me to try it in my vegan gingerbread cookies recipe to give it the final kick. Usually brown sugar or blackstrap molasses is used in conventional recipes for the burnt sugar taste. However, in my vegan gingerbread cookies version you can have it all without the adverse effects of refined sugar. 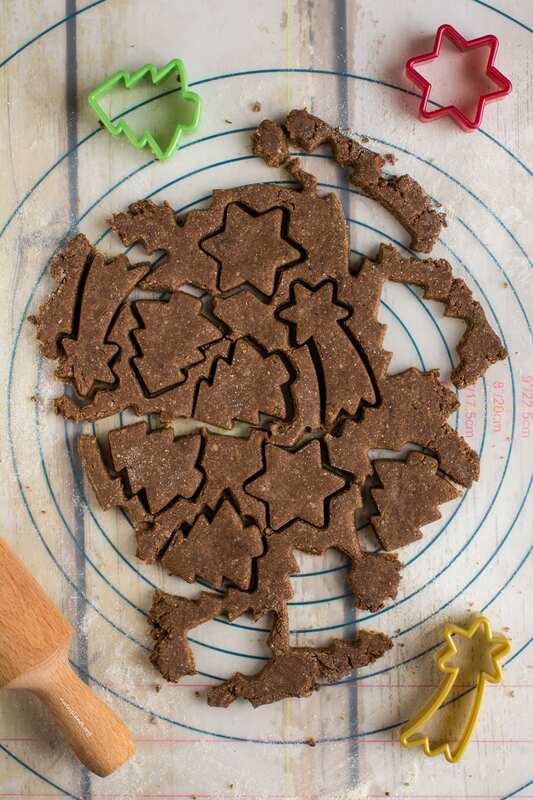 All you need to make my Vegan Gingerbread Cookies! Finally, just when you thought that it couldn’t get any groovier, I announce that even the vegan Royal icing is refined sugar free and oil-free. While the conventional icing is made of powdered sugar (confectioner’s sugar), butter and eggs, my vegan Royal icing uses only 2 ingredients – ground or powdered xylitol and coconut milk. Now, to give it some colour I add natural ingredients, i.e. beetroot powder, wheatgrass and turmeric. In addition, you can use any berry powder, spirulina, blue spirulina and matcha. Probably there are people who don’t have gingerbread cookie forms or those who just don’t want to mess about with all the rolling. Now, I have good news for you! 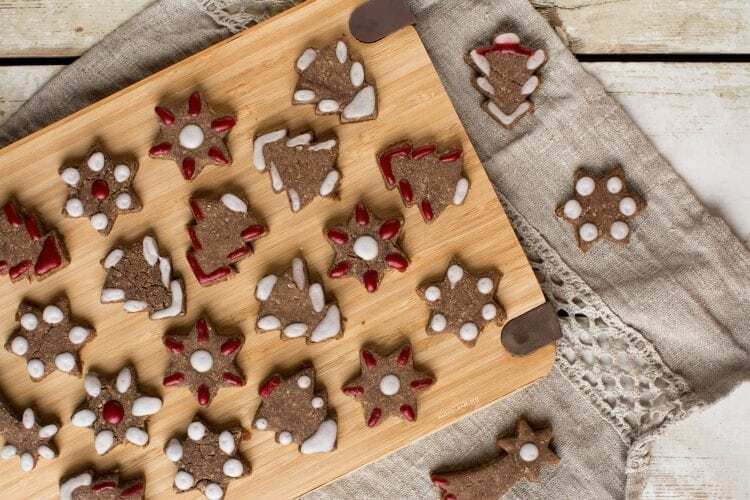 Instead of making those gingerbread men, hearts, stars and whatnot, you can just form thicker or thinner round shaped cookies with your hands. Just like you see on the below photo. And by the way, they are super delicious with freshly made raspberry jam. 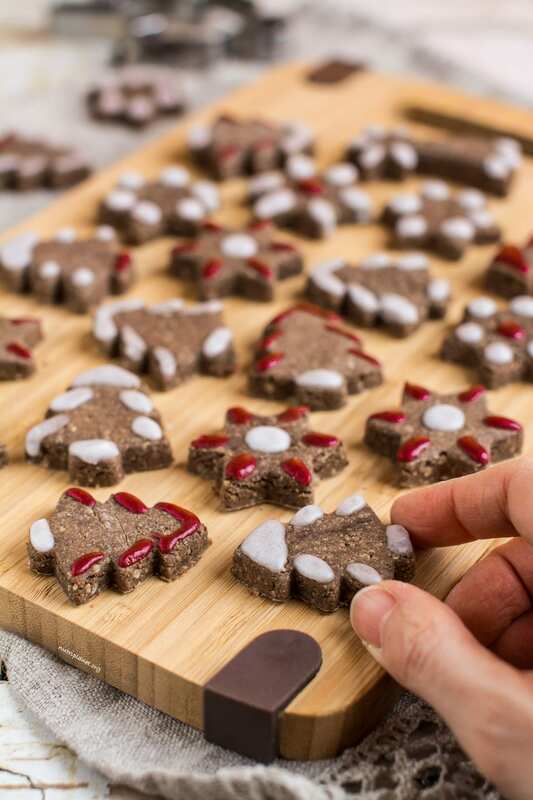 Hand shaped vegan gingerbread cookies (20 grams each) with raspberry jam. 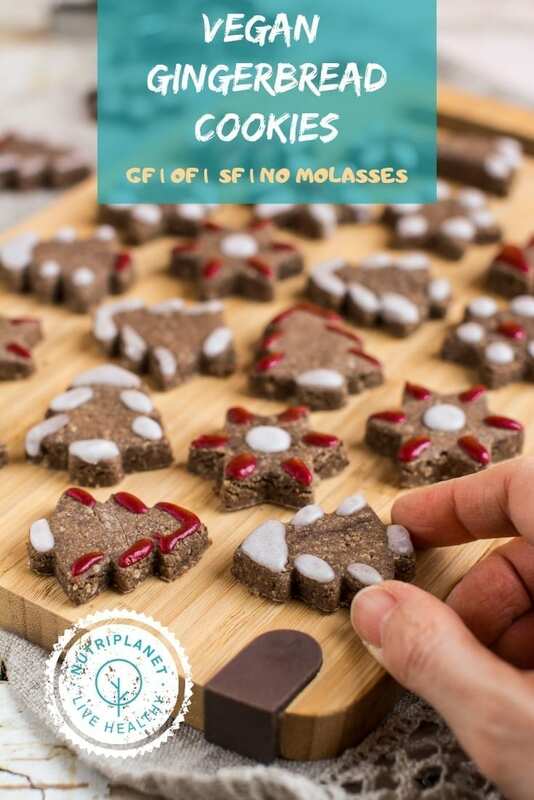 Definitely let me know, if you try my vegan gingerbread cookies or have any questions! Leave me a comment below! First, grind almonds and rolled oats into fine meal. I find it works the best when you grind them together as the oats keep the almonds dry and you’ll not have oily clumps. Then, in a large bowl, mix together the dry ingredients. Next, in a small bowl, whisk together all the ingredients of wet mixture and let sit for a few minutes until the ground chia seeds absorb the liquid. Now, pour the wet mixture on dry ingredients and mix carefully until a well-incorporated batter forms. I find it the easiest to use my hand. Put the dough ball into a sealed container and refrigerate overnight or all day or at least for 6 hours. 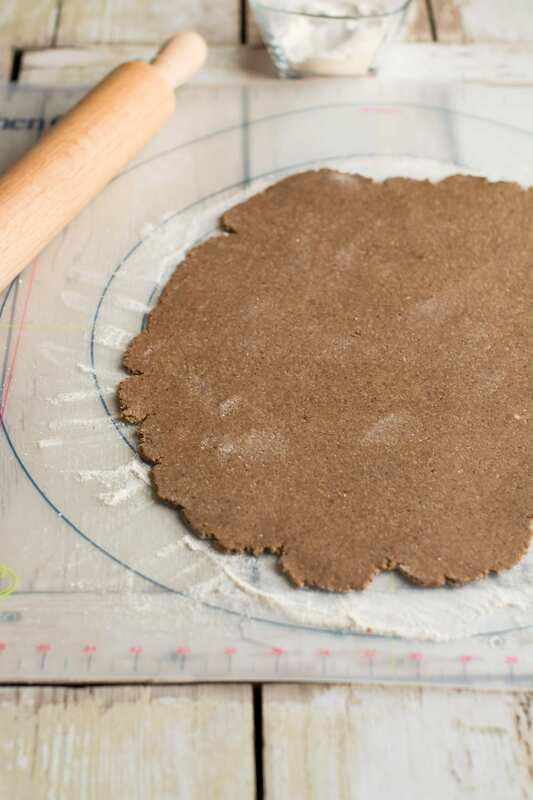 Divide the dough into 2 balls and place one at a time on a floured non-stick mat or on stone surface. Keep the dough you are not working with in fridge. Flour a rolling pin, sprinkle some flour (I prefer unroasted buckwheat flour) on the dough and begin rolling it out until you have a rectangle or circle that is about 2mm thick. I like to press it down with my hands first to ease rolling. When rolling the dough ball try moving it around the surface every now and then to make sure there’s flour underneath and that it wouldn’t stick to the surface. Add flour if it starts to stick. 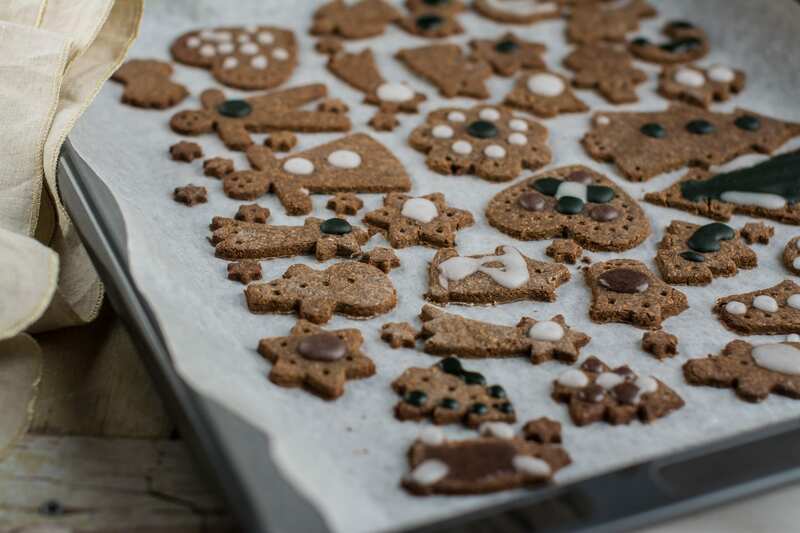 Cut the gingerbread cookie batter into the shapes of your choice and place on a baking sheet lined with parchment paper. Finally, bake for 10 minutes (175°C, 350°F), and then remove from oven. Rotate the pan and return to oven for 3-4 minutes longer, until golden. Let the cookies cool down. Nutritional info (about 25g of cookies, 1/20 of the batter): 85.6 kcal, 9.52g carbohydrates (44.5% of kcal), 4.45g fats (46.8% of kcal), 2.99g protein (14% of kcal), 2.26g fibre, 4.5 GL points. 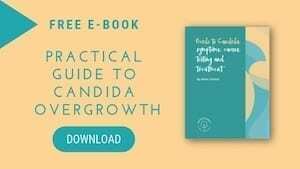 Should you be on Candida cleanse, substitute peanut butter with any other suitable nut or seed butter. You can substitute chicory paste with one teaspoon of dry instant chicory. If you don’t have applesauce in hand, you can use ¼ cup of banana puree instead. I have tried it and it works perfectly! 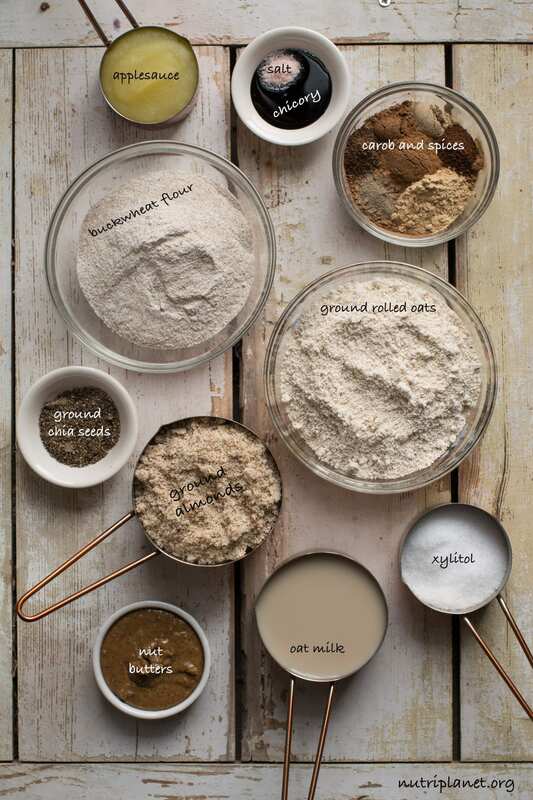 Instead of grinding rolled oats you can also use ready oat flour. Sugar-Free Vegan Royal Icing Recipe with tutorial video. Disclaimer: the recipe contains affiliate links to products that I recommend and that meet my requirements. What a lovely comment Nicole! You really made my day!